Charles was one of nine children born to Thomas and Mary Ellen Wilshaw (nee Webb) and the youngest of their three soldier sons. He was baptised at Biddulph on 26th May 1895. In 1901 he was living with his family in John Street. Ten years later the family still resided in John Street. Charles, aged 16 was a miner, as was his father and two older brothers. Charles enlisted early in the war into the Biddulph Company (Territorials). A number of Biddulph soldiers attached to the 5th North Staffords Service Battalion have been home on a few days furlough. They arrived on Saturday last, and left for Saffron Walden, in Essex, on Wednesday afternoon. These men were originally with the Territorials at Butterton Hall, and were afterwards drafted to Luton and Saffron Walden with the service battalion. 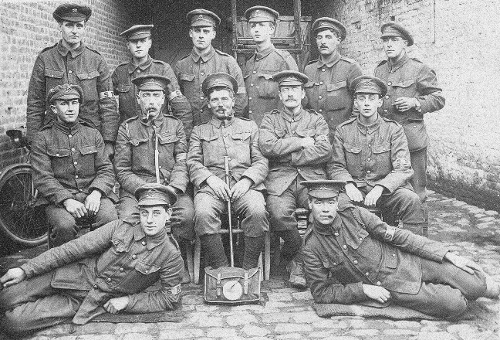 The names of the men, who all look wonderfully fit and well, are: Lance Corporal D.Robinson, Privates E. Doorbar, J.T.Bowers, W Cottrell, C.Wilshaw, A.Booth, L. Ball, F. Boon, T. Ball, W. Morris, C. Cooper, W. Dowan and P. Nixon. 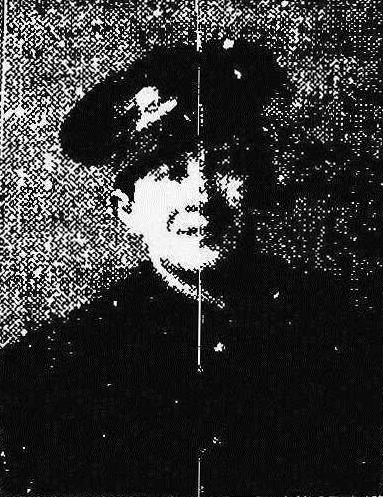 In a letter written in the trenches in France Private Charlie Wilshaw, 1/5th North Staffords, whose brother, Private Jack Wilshaw, K.O.Y.L.I, was killed in action on May 25th, tells his people that the experiences he has been through would make the men in Biddulph tremble. When he wrote they had just under gone an hour’s heavy shelling, some of the shells dropping within five yards of them. It would make a fine picture, he thought, to see the men ‘skute’. Some of them fell down, some dropped flat, and others ran, while I, the irrepressible young soldier added, kept bobbing up and down to see if anyone was hurt. It was quite a treat, observed this cheery young optimist. When he gets back Private Wilshaw does not think he will want to pay a shilling to see fireworks or aeroplanes, for he sees too many there every night and day. 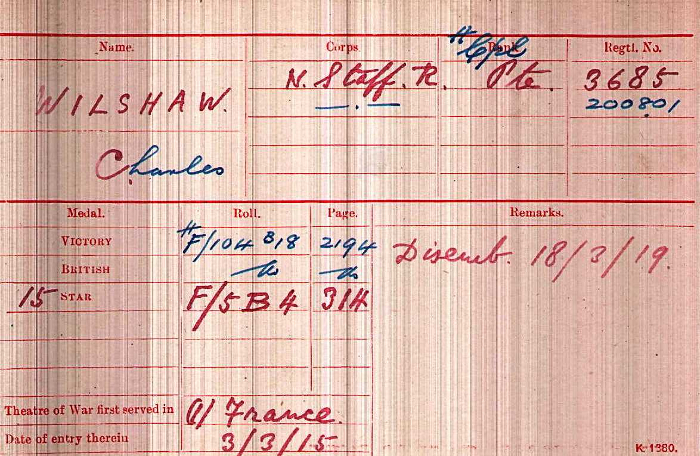 It is thought that Charles died in 1953; his death was registered at Macclesfield. Left: Charles Wilshaw sitting first left on front row. Photograph from the Margaret Bryne Collection.